Tapco's Intrafuse AK folding stock enables you to fold to the right to drastically reduce the length of the rifle. 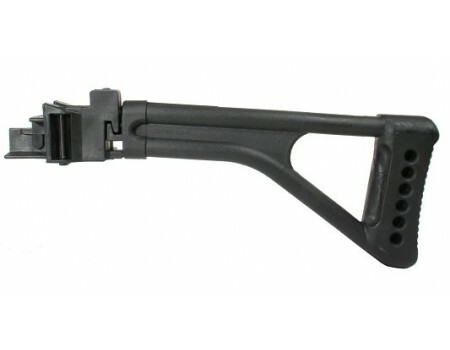 The stock is made of a high strength composite and provides a sling attachment point in the knuckle. When needed, it can easily deploy back to its open position for a rigid shooting platform. This model has a black finish and fits single-tang, stamped receivers. When putting this on a straight cut, stamped MAK-90, some filing will be required to achieve a perfect fit. It is not compatible with milled or slant cut AK, Yugo/PAP or underfolder AKs. This product may be restricted for sale in California and Connecticut. Please contact your FFL or call us at 800-217-2998 before purchasing to verify product restrictions.